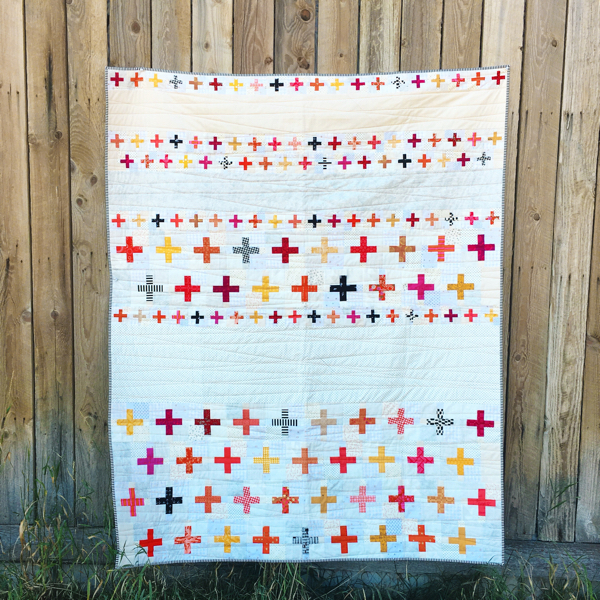 I’m so happy to have a new finish to share with you for Blogger’s Quilt Festival! My Button Box quilt is a variation of a quilt I made last spring, with a twist. Previously, it was made with 9″ blocks and a very pretty fabric line, however, while designing the block I realized that I could easily adjust the size (as you can with most blocks) and decided that I needed to make a scrappy version! I loved pulling fabrics from my stash/scraps for this project, and reminisced where each had been used in previous projects. Some in very different projects, and others had been waiting for this one! While I was selecting fabrics, I tried to use mostly fabrics with the same saturation, or intensity. The few exceptions offer a resting place for your eye in the midst of the busy prints. The blocks are 3″, 6″, 9″ and 12″ with appropriate sized flying geese for each block. I LOVE making flying geese – they are like magic! Even the background fabrics are scrappy, this quilt was all about making with what I had on hand. The different backgrounds offer depth in the quilt top that a solid may not have given it – so I’m glad for the way it worked out. Piecing the blocks into the top took some effort – I had to puzzle out which partial seams to add, and when to finish them. But it was well worth the time spent! I worked on this quilt for six months, off and on, which was a challenge for me! I don’t have the patience to wait to finish things usually, but sometimes life dictates what is to be, or not to be. I worked on it as I could and looked forward to having more time to sew it up! My kids always enjoy “helping” me take photos – it seemed appropriate to include a few of their silly grins! They have watched this quilt from the very beginning, and will now enjoy snuggling with me under it on the couch. 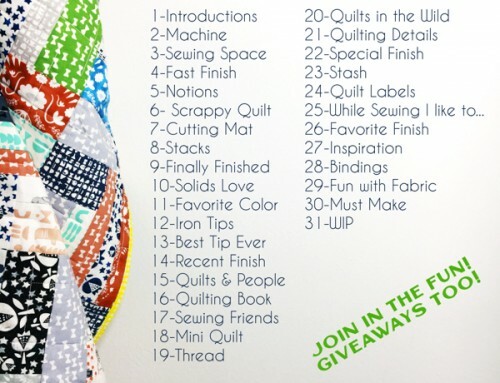 Thanks for reading, and participating in Blogger’s Quilt Festival! I love the online community, and have fun hosting this event every time! **If you are interested, I altered my original pattern to include a layout guide and block count for this quilt. I just love the insouciant joy of this quilt! (and the kids, of course!) I love all the motion you got into the quilt, with the quilting. It definitely adds a fun dimension! What a beautiful quilt! Very fun photo with the kids! Wow! What a gorgeous quilt! A happy party of colours!! Love this pattern. It’s on my list to get and create it and then enjoy it so much. It makes me smile. 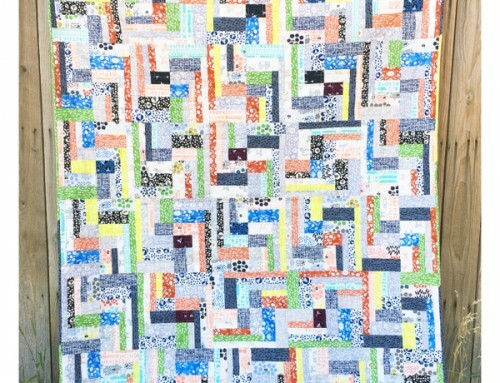 Love a scrappy quilt that means lots of love!! The kids obviously love it too! Such a great photo collage! Sew beautiful Amy!! Love the helpers! What a fun array of color in your quilt. The block is an interesting block to show off that color and I love how it all came together! Your darling kids make your photography so personal. Thanks for hosting this show as it is a treat I look forward to each season you offer it! What an amazing quilt! And I love the photos of your kids goofing around with it! I like it better in the scrappy version actually :) Lots of life and happiness. Both in the quilt and around it. Kids are just so cute when ‘helping’ us taking pictures LOL I asked my boys to just hold up a quilt yesterday and it went totally nuts from there. So I have no nice, stylish pictures for this round of the festival. Button Box is the perfect name for this quilt… All sizes and much variety and special things to be found – just like a button box. The kids are an extra special find too. What a fun quilt! And great photos at the end LOL It’s really lovely, well done! Such a gorgeous quilt, Amy, and now on my bucket list!!! Thanks for sharing! Great idea for a scrappy quilt. I just love all the color. Love your colourful quilt! and the photos – especially the outtakes are hilarious! What fun! 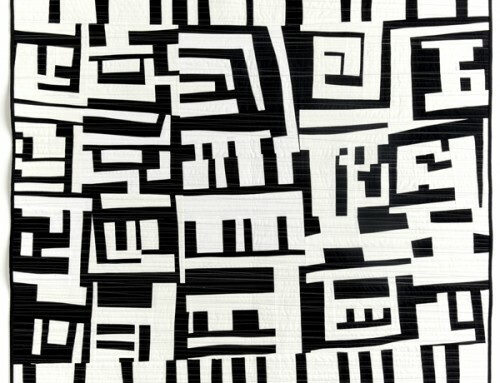 This design is perfect to use for a scrappy quilt. Very colourful and appealing. Snow? Brrrr…..! Love seeing the kids in the pics, too. Gorgeous! I have been staring at the photos for quite a while….love the kids’ joyful photos! I love scrappy quilts, but they are the most difficult for me to accomplish. Thanks for the inspiration. It’s gorgeous! Love the photos of the kids. This is just lovely! It has such a unique look with the scrappiness of the background and all the different sizes of the blocks. Very nice, in every respect! Thanks for sharing it with us! It’s beautiful, Amy! 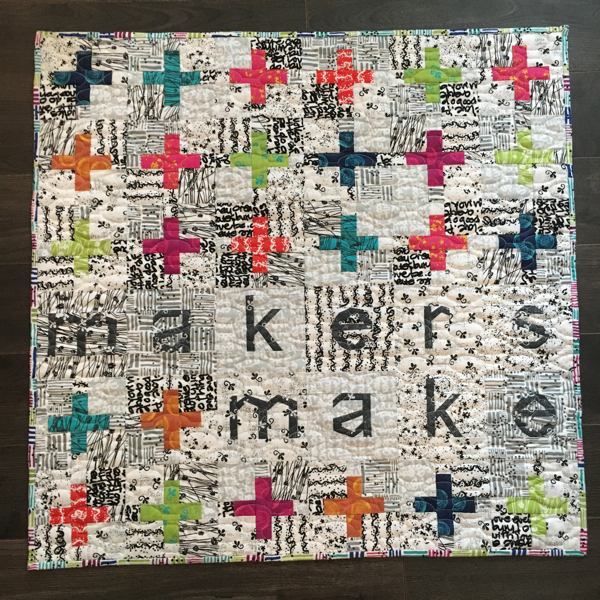 I love a great scrappy quilt and I especially like you used different background fabrics in this one. This is such a great quilt design! What a fun way to use favorite fabrics! What a glorious scrappy and joyful quilt! Beautifully made! STUNNING!!! And I LOVE your quilting! Genius! How cute are your outside shots! I would frame that one! What a great quilt! Love the outtakes too – LOL! Love this quilt, love the festival! Thanks for both, and scrap on! I love your quilt! So much to discover! And I like it to recognize fabrics, we had in our Shop in Munich. Say “Hello” to the kids from freezing Germany! Your quilt is fantastic. I love the variety of prints and the variety of neutrals. Makes it very fun and interesting! And your kids are HILARIOUS!! Wow! That is some beautiful, scrappy goodness! And I lovey how you quilted it! It is a beautiful quilt and I love the scrappy backgrounds very much! Great colours – a true button box! Beautiful quilt. I can see this design has many possibilities. I like how you can incorporate large prints if you want, without chopping them up too much. I love this quilt, especially the slightly different background fabrics… It adds so much dimension. Amy! It’s gorgeous. It’s a scrappy delight. Nicely done! I love all of the size variety! Beautiful fabrics, beautiful quilt! Absolutely a gorgeous BEAUTY Amy! 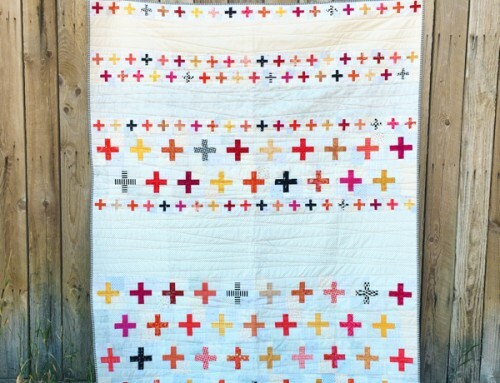 I love everything about this quilt and your story about it. I love all the great colours and prints you used! Beautiful! Its a wonderful way to use scraps! Beautiful quilt! Love that you used what was on hand to complete the entire quilt. I really do love the scrappy look! Amazing quilt! Love the photo with the children. Thanks for your time, your work and your enthusiasm. 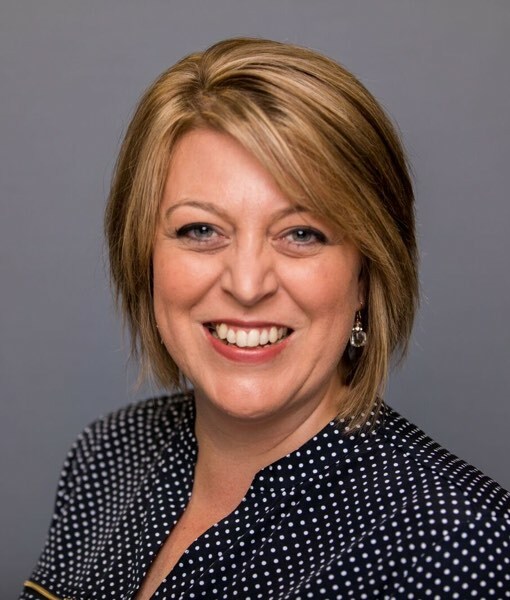 You are an awesome host! this has so much going on. I love all the fabrics you have used. The texture and cuddle factor of this quilt is just fabulous! Love the scrappy background. And the kids. Just not the snow!! A really great scrap quilt. I like that you thought what if about the pattern and changed the sizes to create your own version. Fabulous quilt – the children obviously love it too! Thanks for sharing. Amy, I love this. Of course I looked at the pictures first and was trying to figure out how to make the blocks. Then I read that you said “partial seams” – I have never done partial seams, but you have inspired me to try it. to add my own this time around. Great colors! I love your “models” in the last photo. Thanks for a wonderful festival Amy! Amy, this is an amazing quilt. Love the design, fabric choices, quilting. Inspirational. I love it! I really like how you used the light grey in the background. Fabulous! Love the scrappy design. Lots of movement in this quilt. Very nice. Love this! I want to make one and have lots and lots of scraps! 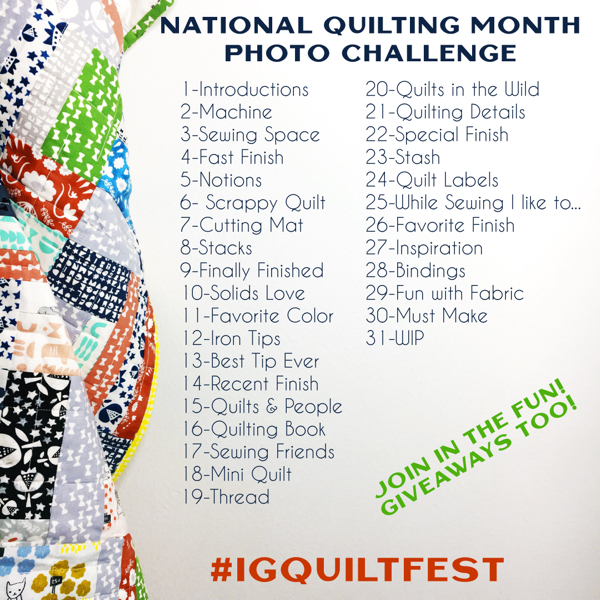 Thanks for sharing – and hosting this quilt fest! Beautiful quilt. I really love the pictures with the kids, so silly and happy. I can’t find Linky! Help? Fabulous quilt! I love the various different sizes of blocks. Beautiful and vibrant! 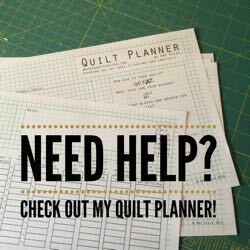 Your fabric choices and quilting for the quilt are awesome! Thank you so much for hosting Blogger’s Quilt festival and for the opportunity to see so many lovely quilts! This is beautiful Amy!!! Love the different size blocks and the scrappiness factor! Love your Button Box Quilt and your use of scraps! Just beautiful!!! 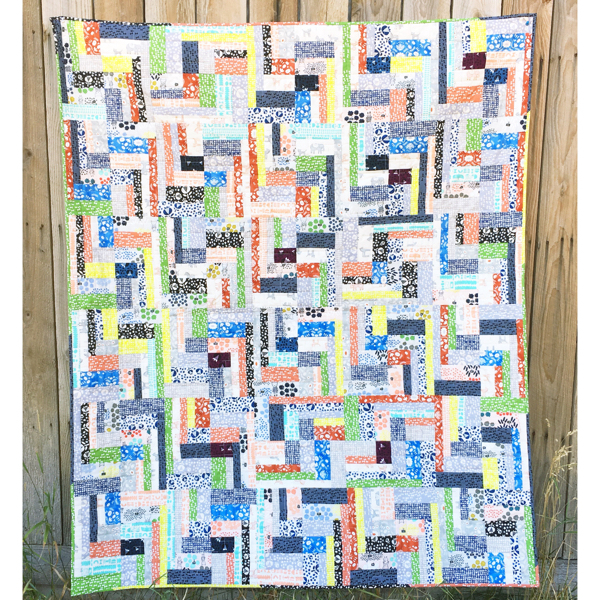 Love the scrappy look of your Button Box Quilt! Your quilting is fantastic! Gorgeous! Lovely quilt. It looks like a great way to use those large prints you’re not sure what to do with. Thanks for hosting another great Blogger’s Quilt Festival. Love all the different sized blocks. Did you come up with the design beforehand? Or I guess what I am asking is, how did you know how many of each size to make? sounds like a math headache to me. I’ve been wanting to do a quilt with different sized blocks like this but wasn’t sure how to tackle it. Thanks! It’s lovely! I really like the variation in the background fabrics. I can’t believe all the work that went into this quilt! It’s beautiful and happy! What a beautiful quilt and stunning entry!! I love how the scraps work so well together. 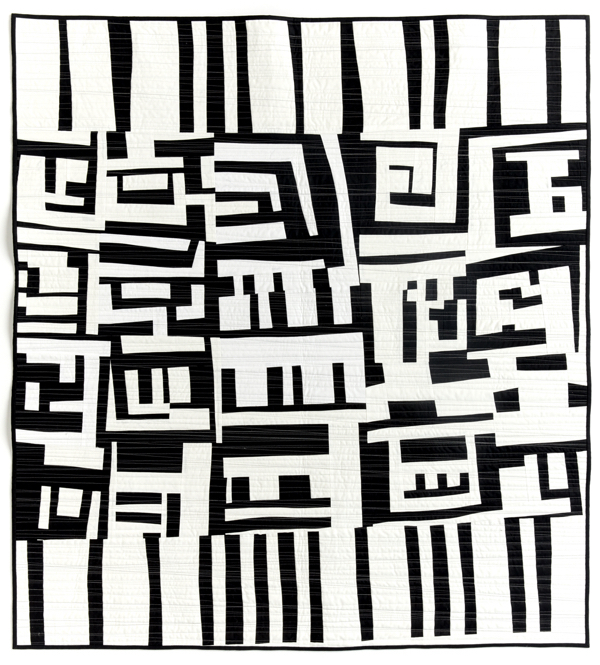 Somethimes scrappy quilts look just too busy but not this one, it looks so perfectly balanced. Love it! What a beautiful quilt! 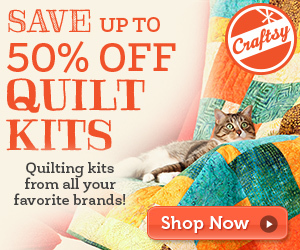 I love the cheery fabrics, and I have always loved quilts that use motifs in different sizes. Thank you so much for doing the Bloggers Quilt Festival. It is so much fun to participate, and see everyone’s quilts. I think the photos with your kids reflect the mood of this quilt perfectly. It’s such a happy quilt. 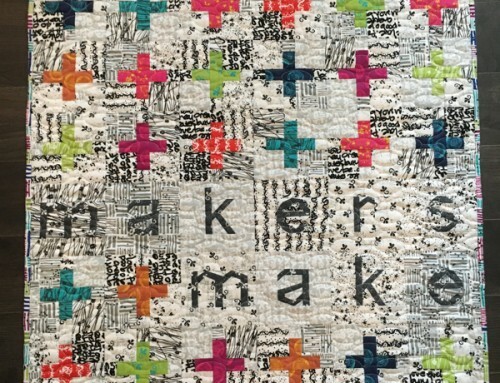 I just love the name of this quilt–it really suits it! The scrappy background looks like yellowed button cards, and of course, the stars look like different sized buttons! I can totally imagine seeing this on a bex in a cosy guest room or bedroom! I do love this quilt Amy! Thanks for hosting a great BQF yet again! Love love love the quilting!! Did you mark it first? It’s lovely and makes me feel happy!